Re:char is a pioneering company that sells kilns to farmers in Kenya that allow them to convert their farm waste into what’s known as biochar, which can then be used for cooking. CEO Jason Aramburu spoke to us about the emerging area of biochar and a grant that re:char just received from the Gates Foundation to develop a system to transform human waste into biochar. Re:char is a pioneering company that sells kilns to farmers in Kenya that allow them to convert their farm waste into what’s known as biochar, which can then be used for cooking. 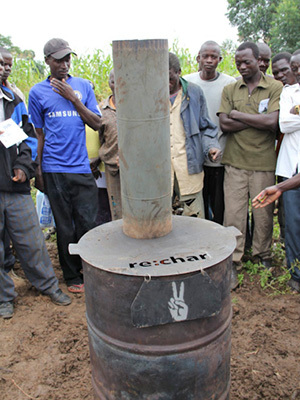 As an enterprise, Re:char seeks to deliver a “triple bottom line,” expanding the uses of sustainable alternatives for energy, providing a cost-effective solution for farmers in an effort to combat poverty, and stemming deforestation in Africa by encouraging use of biochar as cooking fuel instead of cutting down trees for firewood. Jason Aramburu, the CEO of re:char who works in Bungoma, in the Western Province of Kenya, spoke to us about the emerging area of biochar and a grant that re:char just received from the Gates Foundation to develop a system to transform human waste into biochar. Fast Company: Where did you get the idea for re:char? Jason Aramburu: I was doing due diligence for a clean energy investor in New York. After the 2008 financial crisis, the investor I was working for was hit hard. He didn’t show up for work for a week, when he came back, it was obvious that he was negatively impacted by the crisis. He ultimately decided to slow down his operations. As I thought about what I wanted to do next, I reflected back on an experience I had had in college, I had participated in a program in Panama at the Smithsonian Tropical Research Institute where I worked on a variety of different projects involving soil and nutrient cycling. I’d heard about biochar there. After the crash, I thought it was time to try something new, and re:char began. In the Amazon basin for over 3,000 years indigenous farmers have been making charcoal and burying it in the ground. They did this because it improved the soil’s ability to capture and retain nutrients, which led to increased crop yields. The soil is so fertile, that they call these sites terra preta, which means black earth in Portuguese. What the farmers didn’t know 3,000 years ago was that biochar was actually making a lasting impact on the soil. Today at the sites where they buried the biochar, it’s still in the ground. As a result of how fertile the land is, that biochar-rich land is worth about five times as much as the land without it. Are a lot of people working with biochar today? It’s still very new. There are just a handful of companies targeting different ends of the supply chain. Some companies are trying to build multimillion-dollar plants to produce biochar. Those have been slow to develop because the cost is very high and the technology is pretty complex. Our focus is more on the small localized level. This is still very much a frontier. It sounds like biochar could play a role in play in the global energy crisis. I don’t think there’s any silver bullet in renewable and sustainable energy. There’s never going to be one technology that solves all of our energy challenges. Biochar is unique because it’s the only energy source that is actually “carbon negative.” Even under the best scenario, solar energy is only carbon neutral, if you fully account for all the emissions associated with producing and distributing solar panels. When you look at the reality of climate science, carbon neutral is not enough. Biochar is carbon negative, which means that every ton of biochar produced represents carbon extracted from the air, which cannot get back into the atmosphere. How have you built a business around biochar? In Kenya, we produce and sell a device called a rutuba kiln. In Kiswahili, “rutuba” means soil fertility. The kiln costs us $25-30 to produce and we sell it to a farmer for less than the cost of two bags of fertilizer. Most farmers in a year purchase 2-3 bags of fertilizer and that’s typically the largest single purchase that they make. We make the kilns out of repurposed oil barrels in “mobile factories.” In places like rural Africa, it’s really hard to import and transport finished goods efficiently, so we decided to take a 20-foot shipping container and turn it into a rutuba kiln factory. We outfitted a container with advanced metal fabrication tools in the U.S. and shipped it to Kenya. That container is now our production shop, which allows us to produce kilns locally. This model is scalable. We can deliver factories anywhere in the world that a shipping container can go. We go after 1-2 acre farmers who are farming sugar cane and maize, which means they are earning, on average, $300-600 a year. But much of their production is sold by them directly in the marketplace, which means they are not just farmers but small-business people. They can purchase the kiln outright or they can pay for it over time. The farmer takes the kiln and uses the waste they are producing–things like sugar cane waste, corn cobs, leaves, and stalks–and converts the waste into biochar. Then the farmer can take apply the biochar directly to his field to make it more fertile, or take the biochar and turn it into charcoal briquettes which they can use as fuel to cook food. We find that it only takes the farmer about six months to reap the savings from the briquettes and the increased crop yield necessary to pay for the kiln. How hard is it to get buy-in from the farmers? I’d imagine many of them would be skeptical. It’s tricky. Especially in Kenya, a lot of these farmers have seen lots of Western ideas come and go. At first we struggled a bit getting farmers on board and getting them to believe that biochar worked. 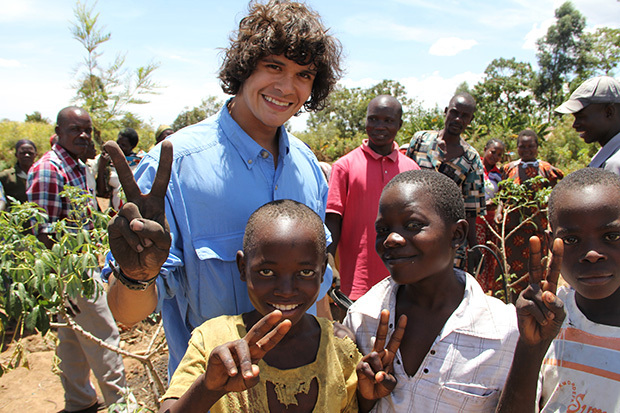 Then we started working with an NGO in the area that is focused on sustainability. They brought us to western Kenya and effectively became our ambassadors and sales team. We’ve also developed test sites around the area where we can show farmers that biochar works. Now we’re setting up a demonstration farm, which will have several different test plots. The farm will allow us to experiment with different kinds of biochar blends. We hope it will become the biochar center for Kenya. What are some of the new things you are doing? We just got a grant from the Gates Foundation to test the conversion of human waste into biochar. Sanitation is a big issue in East Africa. So we’re working with a company building clean toilets to test converting the output of their toilets into biochar. We already know that this works quite well, it makes a very effective fertilizer. We’ve already done a lot of the initial testing. We’re the only people working in this area right now. It’s really a goldmine of feedstock to make biochar. Human waste has the optimal ratio of carbon to nitrogen to grow the crops that humans eat. If you think about it that makes a lot of sense. It’s said that early humans discovered agriculture after they realized that certain plants grew well in their own waste. David D. Burstein is a young entrepreneur, having completed his first documentary 18 in ’08. He is also the Founder & Executive director of the youth voter engagement not for profit, Generation18. His book about the millennial generation will be published by Beacon Press in 2012.